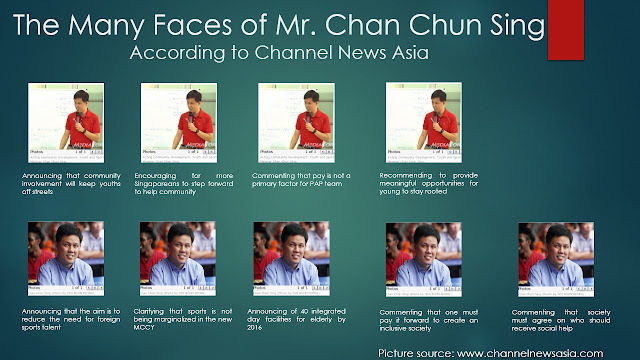 Acting Minister for Community Development, Youth and Sports Mr. Chan Chun Sing has been quite active in the news recently. So much so that Channel News Asia seemed to have problems to find a new photograph of him each time to accompany the news article. In the end, it appears that they have to recycle the same set of photographs of him over and over again, irregardless of whether the topic is on community development, or youth, or sports.. (duh). Look at the number of times the same photograph have been repeated. It reminded me of the early days where we made fun of an ex TCS (Mediacorp) actor by the name of Benedict Goh. That famous 'Many Faces of Benedict Goh' seemed to have disappeared from the Internet world saved for one image in the archives of Mr Brown's Blog. So, here it what I perceived as how Channel News Asia sees Mr. Chan Chun Sing.